The present building stands on the site of a twelfth century Augustinian Priory. It was originally founded in 1160 by Gamelde Pennington as a hospital for the ‘poor, decrepit, indigent and lepers’ of the Ulverston area. The hospital was run by the black canons of the Order of St. Augustine. They ate and slept under one roof, living a common life of poverty, celibacy and obedience in accordance with the example of the early Christians. They also conducted a school at Conishead for the children of their tenants and workers. In 1188 the building was raised to the status of a Priory. It was dedicated to the Virgin Mary and one of her girdles was kept at Conishead as a holy relic. With the change in status came further endowments of land, cattle, fishing rights and tithes etc. The Priory was also actively involved in the Furness iron industry which provided a regular source of income. Some of the endowments brought the Priory into conflict with the monks of Furness Abbey and early records show almost continuous rivalry between the two religious houses. The disputes were finally settled in 1338 when Edward II bestowed a royal charter on Conishead, thus confirming all the grants. This document can still be seen in the Duchy of Lancaster office. Recent excavations of the site have revealed some information about the location and structure of the original buildings. The main church stood on the site of the present south lawn. It was small, cruciform in plan with nominal transepts and a nave about a hundred feet long. The hospital, almshouses and domestic buildings occupied the same site as the present house. Carved sandstone blocks from the medieval chapter house can still be seen in the south wall of the present building. In 1537 Conishead Priory was seized by the crown under the Act of Suppression. Despite strong opposition from the local people, the canons were evicted, the building dismantled and the lead, bells and timber sold for £333. 6s. 3d. Some of the stone was carried to Ulverston and used to restore the tower of St Mary’s Parish Church which had been destroyed in a gale. The remainder was later used to build a large country house on the site. In 1540 the estate was granted by the King to William Stanley, Lord Mounteagle, whose son discovered the Gunpowder Plot. Ownership then passed quickly through the Paget and Machell families and in 1548 to one of the early iron masters, William Sandys of Colton Hall. As Receiver General of Furness, Sandys fell victim to the antagonism towards the crown in the region and in 1558 he was ‘very riotously and murdered at Conishead’. 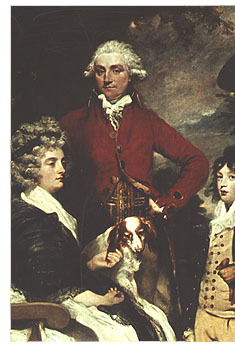 The estate then passed to the Phillipsons and later to the Dodding family. In 1638, Sarah Dodding married John Braddyll of Portfield thus conveying Conishead to the Braddylls who made it their seat for almost two centuries. Five generations of Braddyls lived at Conishead between 1683 and 1847 during which time they established themselves as one of the great local families, renowned throughout the region for their generosity and hospitality. They were generous patrons of the arts and sat for many of the great painters of the period. The Braddyls were great entertainers and played host to many distinguished guests, including royalty. George IV, when Prince of Wales, William IV, when Duke of York and Queen Adelaide all stayed at Conishead and had state rooms in their honour. The last Braddyll to live at Conishead was Colonel Thomas Braddyll (right) a Lieutenant Colonel in the Coldstream Guards and High Sheriff of Lancashire. On succeeding to the estate in 1818 he found the ‘tolerable gentleman’s house’ greatly in need of repair. Rather than renovate the building he decided to have it completely rebuilt. 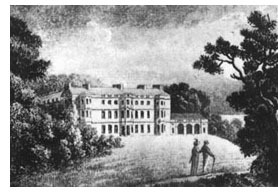 In 1821, Colonel Braddyll commissioned the architect Philip Wyatt to rebuild Conishead Priory. It took fifteen years and £140,000 of Colonel Braddyll’s fortune to complete. Wyatt, whose only other major work was Fonthill Abbey, used a curious blend of styles in his design. It was described at the time as combining ‘imitations of a fortified house with ecclesiastical structure and modern ideas of convenience. Craftsmen from all over the world were commissioned to carve the stone, install the elaborate plaster ceilings and fit the stained glass windows and oak panelling. When completed the house was elegantly furnished throughout and from almost every wall hung a painting by one of the great masters. Unfortunately Colonel Braddyll engaged in unwise speculation and suffered heavy financial losses in the Durham coal mines. In 1848 he was declared bankrupt and forced to sell Conishead Priory. He had lived in his new mansion for only twelve years. The estate changed hands rapidly until 1878 when it was purchased by a Scottish syndicate who converted it to a hydropathic hotel. During this time it became known as ‘The Paradise of Furness.’ With accommodation for over 240 visitors and 110 cars, the hydro-hotel boasted such facilities as salt baths, lawn tennis, pleasure boating, a library of over 1000 volumes and a resident orchestra during the season. The health farmeven had its own branch railway line from Ulverston. 12,480 guests were resident in 1925-6. 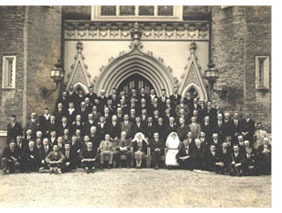 In 1928 the Priory was bought by the Durham Miners Welfare Committee for £35,000 for use as a convalescent home by patients from the Durham coalfields. They came in groups every two weeks, playing bowls on immaculate lawns and dining amidst the collected antiquities of the 18th Century Braddyls. From 1930 to 1972 five matrons and superintendents supervised the estate. During World War II Conishead became the largest military hospital in the North West with a capacity of 400 patients. During the period of October 1940 - August 1945 8,000 in-patients received treatment in the Hospital. In 1972 the Durham Miners’ 44 year tenure at Conishead came to an end and the house and contents were auctioned off. The house stood empty for five years while permission was unsuccessfully sought to develop the site as a holiday camp. It was again sold in 1976 when it became the home of Manjushri Kadampa Meditation Centre. The wheel of history had turned full circle and once again this ancient site has become the home of a spiritual community.